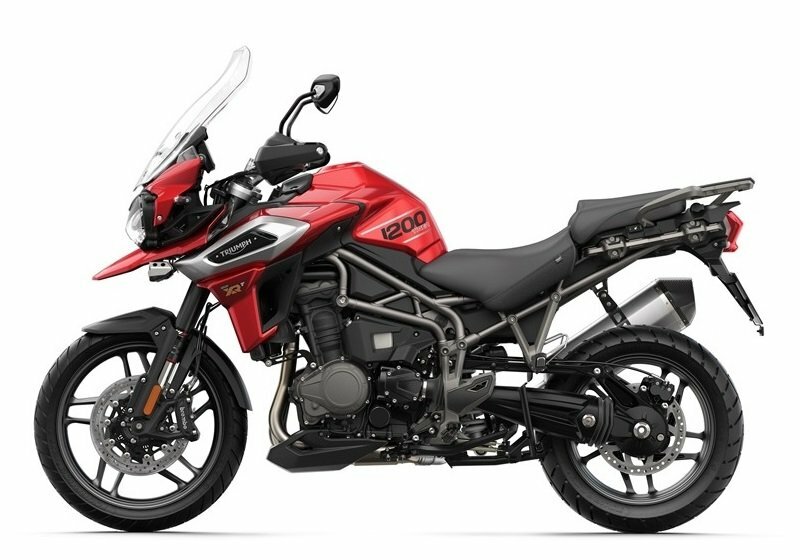 New for the 2019 Season we have added the Tiger 1200 XRt to our fleet of Triumph Tiger hire motorbikes. This top spec. 1200 XRt features the most complete range of electronic accessories and features of any adventure touring motorcycle in the World. The Tiger 1200’s triple cylinder motor is new, and the six-speed gearbox and shaft drive are also refreshed. The 1200 XRt is now 11 kg lighter than its ‘Explorer’ predecessor. If you would like to ride the best Triumph Touring motorcycle for hire in the UK, this fully optioned motorcycle rental is now available to book at RoadTrip. The Tiger’s 1215cc motor is now more powerful and lighter than the old ‘Explorer’ and delivers a whopping 139 bhp (104 KW) @ 9,350 rpm. The XRt specification includes a titanium Arrow performance silencer. The Tiger 1200 XRt is also equipped with electronic suspension, riding modes and full LED adaptive cornering lighting. The bike is also set up with Gear-shift Assist for smooth, clutch-less changes up and down the transmission. Keyless ignition, ABS and traction control also feature on this top spec. Triumph motorbike hire. The new TFT instrument display is complimented by a new, user-friendly toggle menu and backlit switches. 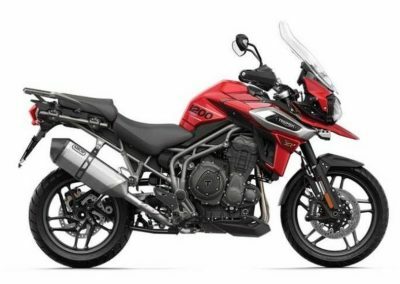 The RoadTrip Tiger 1200 XRt motorbike hire is equipped with a full selection of touring accessories including heated saddle and grips, cruise control, engine protection bars, an upgraded touring saddle and electrically adjustable touring windscreen. The handlebars have been moved 20mm closer to the rider for improved comfort and riding control. 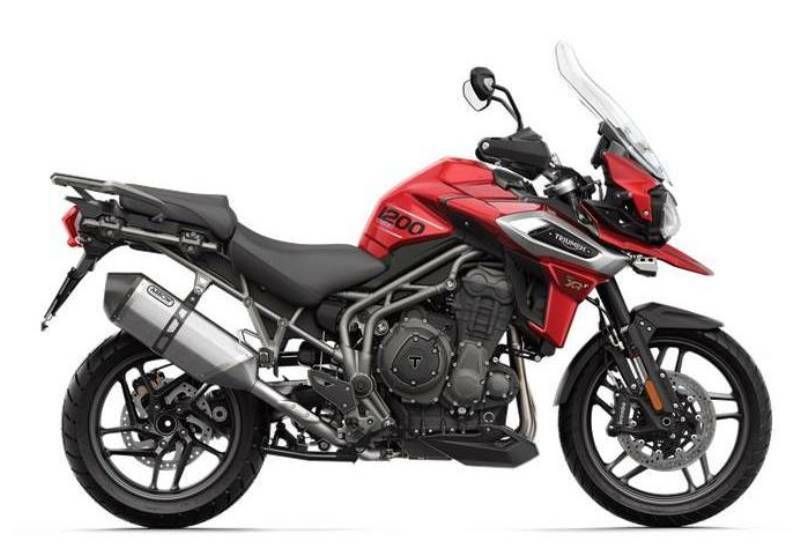 The overall impression of the XRt is of power and refinement and this bike now takes its place alongside the very best adventure touring motorcycles on the market. 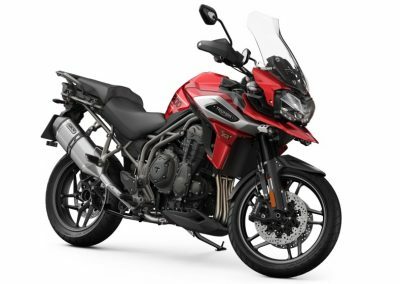 The RoadTrip Triumph Tiger 1200 XRt motorcycle rental is finished in Triumph Korosi Red and is available with matched black, aluminium Expedition panniers and top case, complete with liner bags for easy packing. 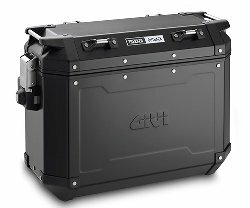 Givi Trekker Outback side cases are available with the Triumph Tiger 1200. Top opening, with carry handles. 37 litre per case capacity, supplied with liner bags. 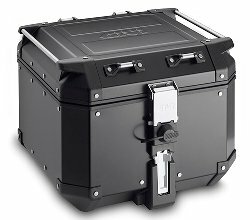 Givi Trekker Outback Top case: . 42 litre capacity, supplied with liner bag. Brakes – front Twin 305mm floating discs, Brembo 2-piston sliding callipers, Switchable ABS. Additional Features Included Riding Modes, TFT multi­functional instrumentation, heated grips & seat, cruise control, cornering ABS and traction control, adaptive cornering lights, hill start assist, up & down gearshift assist, electronic windscreen, titanium Arrow silencer.